Key West Fishing Report are always up to day. Saltwater Angler is a popular Key West fishing charterboat company. Find the best fishing captains. Let's fish in key west! Hello Anglers, with a warm welcome from The Saltwater Angler! The forecast looks good for the 1st week of April. We will have moderate winds out of south and the water has really warmed up. Tarpon are the big news this week. The migratory tarpon are ever where. Many captains are reporting tarpon on both sides of the island, Atlantic and Gulf. The early bite has been the best followed by the late afternoon bite. Darker patterns still work the best with just a little bit of flash for fly fishing. On spinning gear, try using Hogies for artificial bait or live pin fish. Both work well! The flats are on fire with many big Bone fish being landed. Early report has set this year up to be one of the best in a while for the flats. 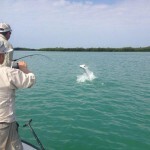 Bonefish are being caught in the 7-9lb range along with a lot of Permit shots too. Small crab patterns have been the fly of choice for both Permit and Bonefish this season. Offshore has remained steady with many sailfish being landed along with some Tuna and KIngfish too. Captains are reporting better conditions this week to the west of Key West for Big Kingfish and Spanish Mackerel in 200-300 feet of water. As usual, the yellow tail snapper bite has been great in 60-100 water just outside of the reef line. As always, this is the Saltwater Angler wishing you tight lines and fish boat side!